Like me, you may have spent the better part of last night and this morning reading about all that's happened – and all that's still happening – after a grand jury failed to indict Darren Wilson of any wrongdoing. Not even involuntary manslaughter. Despite incredible public outcry and over 100 consecutive days of peaceful protests in Ferguson, Missouri, no charges were brought up against an officer of the law for shooting and killing an unarmed person. Demonstrations expressing frustration, anger, disappointment, and sadness over this decision popped up all over the country last night. Our justice system, yet again, has failed Black America. It has failed America, period. The hard reality that must be changed is that, in the United States of America, police can kill black people with zero accountability. We need real, systematic, institutional change. We need it now. Join us today in heeding Lesley McSpadden and Michael Brown, Sr.'s call to fix a broken justice system that doesn't treat black lives with equal respect. Stand with us in supporting our friends at ColorOfChange.org and their call to action. 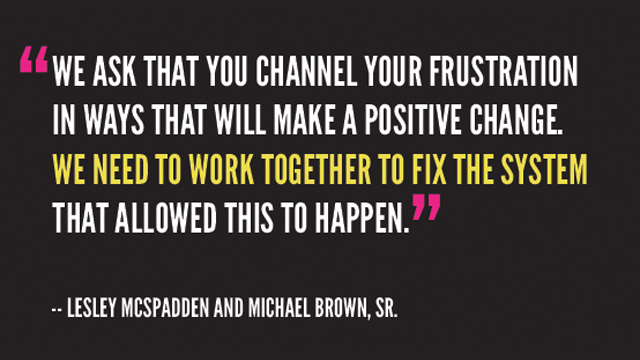 Demand President Obama and US Attorney General Holder to secure justice for Mike Brown. As Desmond Tutu once said, "If you are neutral in situations of injustice, you have chosen the side of the oppressor." Let us not be silent today. Sign the petition at ColorOfChange.org.